One of the big discussions going on in author Twitter, aside from the editor-turned-author who apparently faked his resume, the deaths of his entire family, and cancer in order to boost his career, is about something another author has said about authors needing to take the leap and quit their day jobs if they want to get ahead or write well, or something like that. As a writer who hasn’t had a day job for 17 years, I have thoughts about that. My career probably falls into the category of “don’t do it this way” and isn’t at all typical. In my case, quitting my day job wasn’t really a choice. I got laid off, and since at that time just about everyone in my field was getting laid off, the odds of me being able to get another job were slim. There were a lot of people competing for a very few available positions. One of my colleagues laid off on the same day took a couple of months to get a new job that was a step down from where she’d been and then got laid off from that job and the next job before she had to move to another city to get the next job (I think she’s on about her tenth job since then). I was in a terrible position to try to become a full-time novelist, since I hadn’t sold a book in years and the category line I’d been writing for had folded. I had an agent, but the book she’d submitted hadn’t sold and there had been no response on the follow up book (I later learned that she may not have actually submitted it, since editors she supposedly sent it to had no idea what I was talking about when I met them later, but that’s another story and I have a different agent now). 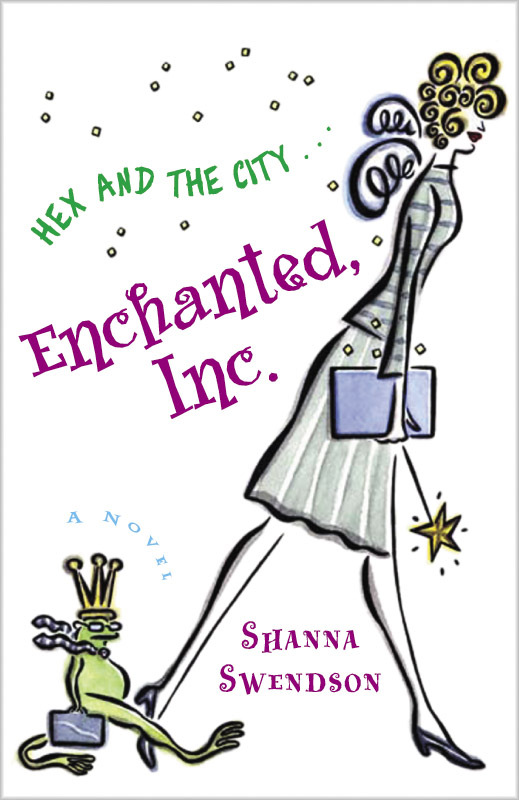 I’d just come up with the idea for the book that became Enchanted, Inc., but hadn’t started writing it and had no idea whether there was even a market for it. On the other hand, I’d already bought a house and had a relatively new car that I’d paid cash for, so I didn’t have to worry about being able to show employment for a credit check. I had a freelance writing gig that pretty much paid my mortgage. I had no other debts. I’d been saving money all along. I’m generally pretty frugal, so as I got raises, I maintained my old lifestyle and put the extra money in savings. I had my direct deposit set up to automatically put a chunk of my paycheck into savings. All the freelance money and any royalties or book advances went straight into savings. I’d been working for a division of my company that had previously been a company bought out by my company, which meant I got some profit-sharing bonuses as part of the buyout agreement, and all that went into savings. When I factored in my severance payment, I had about three years of living expenses saved up, not even counting my regular freelance gig. The day after I got laid off, before I’d even made any decisions about what to do, I started getting calls from former clients wanting to hire me as a freelancer. I had my first interview for a freelance assignment the Monday after I got laid off on Thursday. So, I didn’t really quit my day job to be a novelist. I got laid off from my day job and decided to freelance as a marketing communications writer to give myself the chance to try to be a novelist. I did taper off on the freelance work after I started selling books, but I was able to keep that steady gig for the first ten years or so of freelancing. There have been years when I dipped into my savings, and there have been years when I added significantly to my savings. I’m lucky that I got a health insurance plan soon after I got laid off that’s grandfathered. It doesn’t contain all the ACA benefits, but most of those are benefits I don’t need and it’s significantly less expensive. We won’t even get into how ridiculous it is that healthcare is tied to employment. That’s an entirely different discussion. That’s how I’ve made it work financially. How has it worked creatively? I don’t know that I write significantly more than I did when I had a full-time job. My daily word count when drafting is about double, but I don’t make myself work weekends now, while I did spend most of my weekends writing when I had a full-time job. Mostly what I gained was mental and emotional energy. I’m on the extreme end of the introvert scale, and going to an office where I spent the day around people utterly drained me. I would come home from work and fall asleep on the sofa even before dinner if I wasn’t careful. When I started writing seriously, my social life dwindled to nearly nothing because I didn’t have the energy to see people in my free time and still be able to write. Writing full-time gives me the chance to do something other than work and write. I still don’t have that active a social life, by choice, but I get out a fair amount, just due to choir, church, several social groups I’m involved in, etc. I have time for music, to read for pleasure, to exercise, to cook. I think I’m a lot healthier than when I was working all day in an office, then coming home and sitting at my desk after microwaving something for dinner. Not having a day job means I feel like I can breathe. I do think that writing full-time improved the quality of my work. I feel like I have the time to dig deeper in developing stories and in editing/revision. I don’t think I could have managed what I do now with things like reading the last draft out loud. It would take me about a year or more to write a book like Rebel Mechanics if I had to do it part time because there’s just so much research involved. When I’m doing research for a book like that, I’m spending hours a day just reading. I suspect that if I were having to do it part-time, I would skimp on the amount of research and preparation. I can devote my brain all day to my story and characters, even if I’m not actively writing, and that’s something I couldn’t do when I spent the day at the office. I don’t know how anyone could do the kind of promotion that’s necessary today with a full-time job. My books published while I was working were category romances, so they were only available for one month. There might have been an intense month of booksignings and message board posting, but then you were done once the book was off the shelf. Now books stay out there, and there’s social media, blogging, and all that. It’s nice not having to take vacation days to go to conventions or to travel for book events. I can accept gigs to speak at schools and libraries without fitting them into a work schedule. I really don’t think I’d have the writing career I have today if I’d gone looking for — and found — another job instead of deciding to give writing full time a shot. I might never have written the books I’ve written. I’m not sure I’d have actually stuck with writing because I was so discouraged then that I was on the verge of giving up. Realizing that I had to make it work before I ran out of money was wonderfully motivating. I loved my freedom so much that the dread of going back to an office job made me very determined. I think it would have been easier to just give it up, work full-time (if I could have found a job), and use my free time for fun. I’d probably be more financially secure now, but I might also be utterly drained and unfulfilled. And then there’s the issue that there really weren’t jobs in my field and I hated my field. I probably would have had to try to change careers and start over in something else at a lower level and work my way back up. What it boils down to is what works for you. Every person’s situation is different. Everyone’s tolerance of uncertainty is different. I know of a lot of people who have been far more productive — and successful — than I have while holding down demanding day jobs. But then I’m not sure I’d have managed to keep writing at all, other than maybe as a hobby, if I’d gone looking for a job when I got laid off, so I’d have been even less productive and successful. Then there are things you don’t control that can change your circumstances or alter your decisions. No one can say “you must do this!” and have it apply to everyone. I disagree with the guy saying you must quit your day job, but then I also disagree with all the people saying quitting a day job is a bad idea.